Chateau by the Sea is a horseshoe-shaped North Myrtle Beach resort that is beautifully located on the white sandy beachfront. 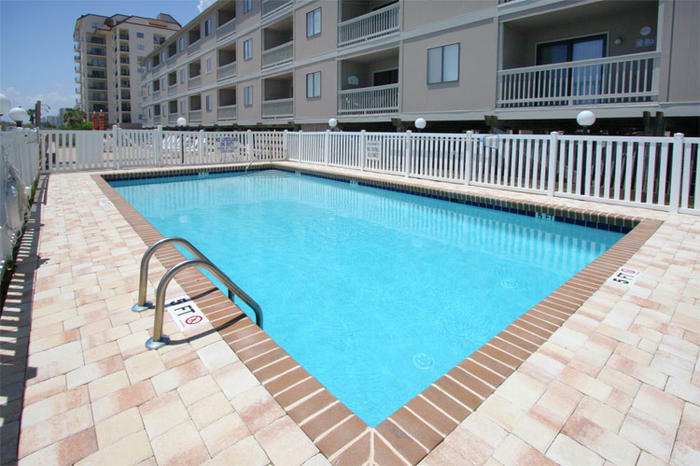 This North Myrtle Beach resort is three levels of North Myrtle Beach condominiums with four staircases that lead from the parking lot to the North Myrtle Beach rentals. There is not an elevator in this North Myrtle Beach resort that is built on stilts. A sun deck spans the width of this North Myrtle Beach resort and faces the Atlantic Ocean, giving all sunbathers amazing views of the beach while the swimmers can admire the vistas as well. This North Myrtle Beach resort is in the Ocean Drive section of North Myrtle Beach, South Carolina. It is just a few blocks south of Main Street where you can readily find shops, cafes and beach clubs with beach music. Ocean Drive is most popular for being the birth of the shag dance. This South Carolina State dance is a locals’ favorite and North Myrtle Beach, SC is home to a couple of annual shag dance festivals, therefore it is easy for guests and visitors to find locales where they can learn the smooth moves of the shag! Chateau by the Sea is a mid-size North Myrtle Beach resort that boasts a myriad of two-bedroom, two-bath North Myrtle Beach condominiums. All of these condos in North Myrtle Beach, South Carolina can sleep either six or seven people. They all have a fantastic kitchen and they all boast ocean views. With conveniences and a beachside view from the privacy of your North Myrtle Beach condo, what more could you want? How about a DVD player, microwave, dishwasher and laundry facilities in these non-smoking North Myrtle Beach vacation rentals? The kitchens in these North Myrtle Beach condo rentals are plenty spacious with full-size appliances and an array of dishes and cookware for your use. In most of these North Myrtle Beach vacation rentals there are more than one television and at least one DVD player. Bring the kids’ favorite movies to the beach with you and let them nestle down with a good show while you enjoy the ocean views on your private balcony. There is a microwave in these kitchens at Chateau by the Sea so you can make some popcorn and let them have a real movie night during your North Myrtle Beach vacation. After your family plays hard on the Myrtle Beach area golf courses, nearby miniature golf courses, hiking trails at the oceanfront state park and all the rides at the amusement park, you might want to do some laundry. When you vacation at Chateau by the Sea you can toss a load into your own washing machine and clothes dryer that are furnished for you in your North Myrtle Beach vacation rental. Elliott Beach Rentals is not affiliated with onsite management or the HOA of Chateau By The Sea.